Hotel rewards offer numerous money-saving incentives for frequent travelers. They're all free to join by filling out a simple form on each hotel's website. Determining the best rewards programs for your needs depends on how and where you travel and the value you place on each program's rewards. In a 2015 J.D. 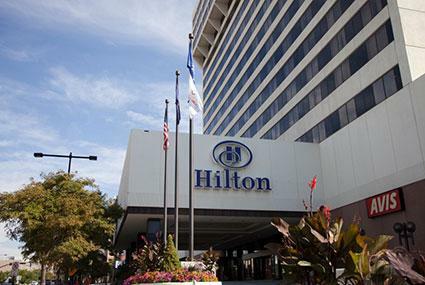 Power report, the Hilton HHonors hotel rewards program tied with Delta Privilege for first place in customer satisfaction, partially for its ease of earning and redeeming points. Hilton HHonors was also the top pick at The BigDoor Blog, where it is favored for zero blackout dates and the ability to earn points for hotel nights and airline travel during the same stay. Just by joining the program, HHonors members get a guaranteed discount rate, free Internet access and digital check-in from a mobile device. Higher membership levels are achieved based on frequency. Stays count as one check-in and checkout but may include more than one night. Hilton credit cards - Earn 60,000 points and Gold status membership after spending $3,000 in the first three months. Travel partners - Earn points or miles flying with Delta, United or American Airlines and with car rentals through Alamo or National. Shopping and dining - Earn points shopping online at Hilton HHonors Shop-to-Earn Mall and eating out at restaurants by signing up with Hilton HHonors Dining. One free night in a standard room requires a minimum of 5,000 HHonors points. Some hotel categories have a range of points for a free night due to peak and off-peak seasonal pricing. You can also combine your points with money to book a room so you don't have to wait until you accumulate all the required points. Points can also be used to upgrade an existing reservation to a premium room or a luxurious suite. Use points during your stay for on-property rewards such as spa treatments, golf lessons or fine dining. Hilton HHonors points expire if your account is inactive for 12 consecutive months. Hilton's @Play program contains rewards such as live concerts, movie premieres, red carpet awards, sporting events and culinary experiences that you can redeem instantly for a set amount of points or you can bid on them. On View From the Wing, travel expert Gary Leff says Hyatt Gold Passport is the most rewarding hotel program for free nights, based on his extensive research of base-level earnings. Additionally, Hyatt Gold Passport has been awarded the Best Elite Program by the Freddie Awards for three consecutive years, in part for its generous rewards to higher-level members. Hyatt Gold Passport has only two elite membership levels above the standard gold membership acquired just for signing up. Platinum membership - After five stays or 15 nights, enjoy complimentary premium Internet access and guaranteed 72-hour room availability. Diamond membership - After 25 stays or 50 nights, enjoy complimentary premium Internet access, guaranteed 48-hour room availability and four suite upgrades every year. For every eligible dollar you spend at participating Hyatt properties, whether it's on a room, at the spa or in one of their fine dining restaurants, you earn five Hyatt Gold Passport points. Earn 500 bonus points with every eligible car rental at participating Avis locations. Earn up to 50,000 bonus points by hosting an event or meeting. Receive one bonus point for every dollar spent on guestrooms, meeting rooms, banquets and in-house catering. With as little as 5000 points, you can get a free night in a standard room. The following chart shows the number of points needed for standard rooms, Regency/Grand Club rooms and suites at Hyatt Hotels, according to the hotel category. If you don't have enough points to cover your room, you can combine them with cash. You will need at least half the points required for the room. Upgrade a Regency/Grand Club room for 3,000 points or go up one level from a standard room for 6,000 points. Use your points to pay for on-property meals or spa treatments. Use them during checkout for charges such as in-room movies or parking. If your account stays inactive for a period of 24 consecutive months, Hyatt will close the account and all the points will be forfeited. U.S. News & World Report ranks Marriott Rewards number one on their 18 Best Hotel Rewards Programs list. Marriott Rewards also earned Program of the Year at the 2015 Annual Freddie Awards for the eighth straight year, according to Forbes. The program is popular with travelers due to the large number and diversity of hotels available and the many options for redeeming points. Elite members also get guaranteed lounge access with complimentary breakfasts or 750 points in place of breakfast. Earn up to 50,000 points by hosting a meeting or event, even if the guests pay for their own rooms. Refer friends to the program and earn points on their first five stays. Get points for purchasing products at Marriott's online mall or with a car rental at participating Hertz locations. The number of points needed for a free night at a Marriott property depends on the hotel category. Each hotel's website states its category number. You can also combine points with cash to book a room if you don't have enough points for a free night. Use points during your stay to pay for room service, room upgrades, meals in the hotel's restaurant and spa treatments. Points can also be redeemed for travel and shopping benefits. Convert points to miles by transferring them to your frequent flyer account. Combine hotel points and airline miles for vacation packages. Use points for car rentals or a discount on a cruise. Marriott also has a site for shopping with points called Populr Rewards. Points expire if there is no activity within two years. CardHub performed a detailed analysis of the reward programs offered by the 12 largest U.S. hotel chains, comparing each one to see the value it offers to consumers of varying spending levels. They concluded that Wyndham Rewards is the best hotel loyalty program for travelers of all spending levels, offering the highest value on rewards compared to the money spent. Wyndham Rewards also takes a second place ranking at U.S. News & World Report. Members get the best available room rates when booking room reservations, plus up to 2,000 bonus points when booking two weekday nights. Book at least seven days in advance and get an additional 15% off the best available rate plus 200 additional bonus points. Earn 10 points per dollar or 1,000 points, whichever is more, during each stay. You can also convert your points to airline miles through your frequent flyer account. Car rentals from Avis or Budget are worth 100 points per day. Join LifeLock and get 7,000 Wyndham points. You don't have to sort through hotel categories or even look at a chart to start redeeming your points for free nights. It takes 15,000 points for a free night at any Wyndham property, even the upscale Dolce Hotels. If you want a faster reward, you can book a room for 3,000 points and make up the difference in cash. Use your points to rent a car from Avis or Budget. Use them to purchase an airline ticket or convert your points to airline miles. Redeem your points for gift cards for stores like Best Buy, Macy's, Home Depot and Kohl's or restaurants like Chili's, Olive Garden, Subway and the Hard Rock Café. Wyndham Rewards also offers online shopping for a variety of merchandise including electronics, home goods, apparel and jewelry. Wyndham Rewards points expire if the member account remains inactive for a period of 18 consecutive months. According to TripIt, an award-winning travel organizing app, Starwood Preferred Guest is the best option for serious business travelers, with a low threshold for earning elite status and an ample selection of both city business hotels and vacation resorts. The Travel Channel endorses Starwood's loyalty program for business travelers as well, noting the value of elite member perks such as late check-out. With elite status you can check out as late as 4 p.m., get guaranteed room availability and earn higher points for hosting meetings and events. Earn points even faster with the Starwood Preferred Guest Credit Card by American Express. By meeting the minimum spending requirement on the card, you can accumulate 25,000 Starpoints or 50,000 if your spouse is a member and signs up too. Earn one Starpoint for every dollar spent on Delta flights or earn 1 mile with every dollar spent at Starwood hotels if you decide to convert your points to your Delta Sky Miles account. If you use Uber when you travel, you can also earn one Starpoint for every dollar spent on rides. You can combine cash and points to book a room, with as little as 1,500 points and $30. Upgrade to a better room for as little as 1,000 points or use your points to pay for spa experiences or meals. Use can also use Starpoints to book flights online with over 150 airlines. Go sightseeing on a train ride by converting Starpoints to Amtrak Guest Rewards with a one-to-one ratio. Link your SkyMiles account to convert Starpoints to airline miles. Use points for a $50 car rental voucher from Avis. Redeem points for entertainment and shopping. Get star struck using Starpoints for premium seats, meet and greets and backstage tours with popular music artists. You can also get VIP access to sporting events and cultural engagements such as the Westminster Kennel Club Dog Show or red carpet premieres. Turn Starpoints into gift cards for shopping on Amazon. Starpoints expire if the member account is inactive for a period of 12 months. For family travel and those traveling on a budget, Best Western Rewards is a top choice loyalty program, ranking third on the Best Hotel Rewards Programs list at US News and World Report for three consecutive years. It's the only hotel rewards program with points that don't expire, making it one of their best features. Another unique benefit of joining Best Western Rewards not found with other loyalty programs is the Status Match, No Catch offer. Best Western will grant you elite status immediately if you have already earned it with another program. All you need to do is download a form and provide proof of your elite status membership to start earning bonus points and higher membership level perks with Best Western Rewards. Besides the increase on bonus points, the top three levels only offer room upgrades and recognition gifts as extra benefits to top-level members. Each time you stay at a Best Western hotel, you earn 10 points on every dollar spent. Choose from over 4,000 hotels worldwide. Diners Club - Convert your Club Rewards points to Best Western Rewards points. Airline partners - Earn points flying with Southwest Airlines, American Airlines, United and many more. Car rentals - Rent a car with Budget or Avis to earn points. Florists - Brighten someone's day with a bouquet of flowers from FTD or Teleflora and earn 1250 points. Wine club -Earn up to 12,500 points by joining a wine club and sampling six different wines. Point can be used to buy free night room vouchers. The vouchers range in value from 8000 to 36,000 points, depending on the property type and location. You can search for properties on Best Western's homepage by location. Select Best Western Reward points from the drop down list under special rates to see how many points you'll need for each location. With 21,000 points, you can get an annual pass into America's national parks. A reloadable travel card that can be used for hotel charges at any Best Western location worth $50 can be had for 12,000 points. Car rental coupons worth $50 will set you back 11,600 points. Use Best Western Rewards points for a date night at your favorite restaurants. At $25 gift card for Red Lobster/Olive Garden takes 6000 points. A $25 Brinker gift card which can be used at Chili's, Macaroni Grill or On the Border takes 6000 points and a $25 Subway gift card requires 6500 points. Best Western Rewards has a rather limited selection of merchandise that can be purchased online with points but you also have the option of retailer gift cards or something practical like a gas card. According to Family Vacation Critic, Kimpton Karma Rewards is the top choice for the best family hotel rewards program, with its colorful, hip properties and loads of kid-friendly amenities. Kimpton is also recommended as the best program for luxury seekers, due to upscale perks such as a $30 in room spa credit, a $10 mini bar credit and pillow preferences. Once you sign up for the program, you can instantly benefit from free Wi-Fi in your room, a complimentary drink and custom stay preferences. You must achieve at least Tier 2 for the $30 spa credit. Higher level memberships also offer complimentary room upgrades, late checkout, newspapers delivered to your door and VIP reservations to hotel restaurants. Kimpton Karma Rewards differs from other hotel loyalty programs in that you earn 'credits' instead of points. Each time you stay at the hotel your account is credited and those credits help you achieve free reward nights, higher status and additional benefits or rewards. Kimpton Karma rewards credits can only be used at Kimpton hotels. It's important to provide your Karma Rewards membership number when booking your reservation to ensure your account gets credited. Always book directly with the hotel. Members can get credit toward tier advancement by dining in a participating Kimpton restaurant. You must pay the check with a credit card that is registered to your Karma account. Check the terms and conditions page for a list of hotels that do not participate with the restaurant credit. To earn a free night, you must have seven eligible stays or 20 eligible nights credited to your account. Every time you reach this threshold, you earn a complimentary night and reaching it just twice puts you in the Inner Circle. Complimentary room night rewards have a one-year expiration date. Inner Circle members get a $50 restaurant credit when redeeming a complimentary night at a new hotel. Members also have access to discounted room rates and free nights in various locations by checking the deals and offers page on Kimpton's website. Analyzing a loyalty program's benefits and the ease of earning free nights or elite status can help you determine if you are getting the best return on your investment. Decide which privileges suit your traveling lifestyle the best, whether it's diverse property types and wide coverage, business or family oriented amenities or perks like free upgrades. Compare what's offered to help zero in on the best program for you.